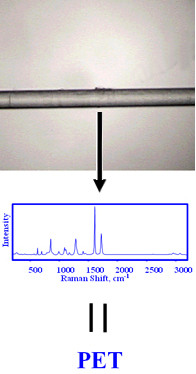 Raman spectroscopy is a powerful analytical tool for the study of forensic materials. Advantages of Raman spectroscopy in this area are the non-contact and non-destructive nature of the measurement, the ability to couple with a microscope to view and analyze small samples down to pico-mole quantities, to couple to a fiber optic probe for remote sampling, and the inherent chemical specificity of Raman. The ability to analyze both organic and inorganic compounds, either volatile or nonvolatile species, and examine them often in situ inside glass or transparent plastic containers or evidence bags has also increased the interest in and utility of Raman for forensic applications. Application areas include identification of drugs of abuse, explosives, and chemicals commonly found in clandestine laboratories. Other areas include identification of hairs, fibers, paints chips, and inks. Raman microscopy may also be coupled with substrates in order to increase sensitivity using the phenomenon of surface enhanced Raman spectroscopy (SERS).